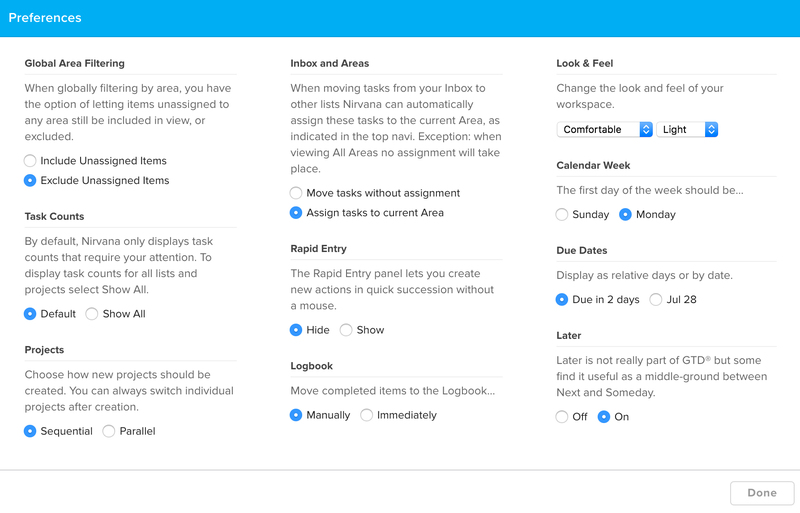 Nirvana has several options that allow you to customize your experience as a user. This section will teach you the ways in which you can make Nirvana your very own. Using the web app, use hotkey , to access your preferences. 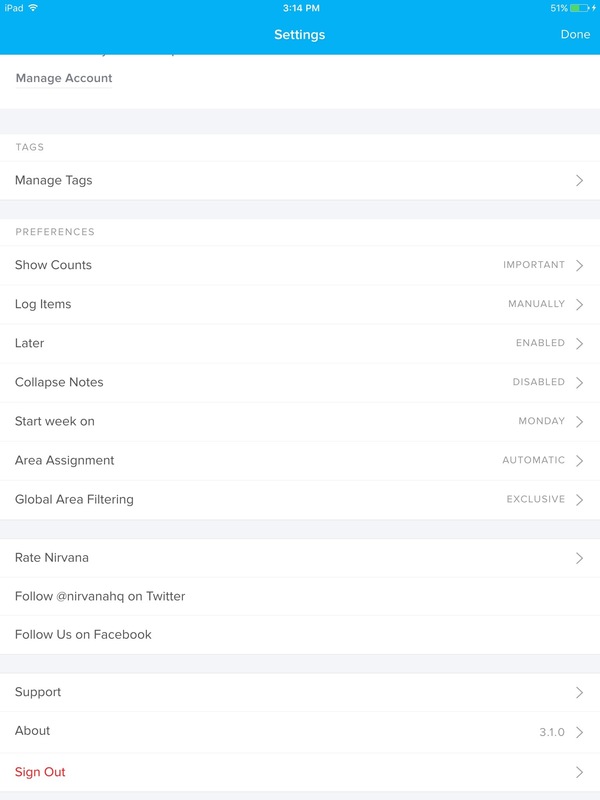 You can also click Settings in the top navigation bar and choose what you want to manage from the drop-down menu that appears. Good to know: Once you update your profile information, you’ll see your name instead of Settings in the top navigation bar. Using the mobile app, tap the 3 horizontal lines in the top-left corner, or swipe the screen from left to right. Tap the gear icon from the side navigation that appears and you’ll see the Settings screen. Go to your account dashboard, scroll down to Profile, click the Edit Profile link, and change your information. Go to your account dashboard, scroll down to Password, click the Change Password link, and follow the instructions on the page. Good to know: You will need to enter your current password in order to update it. If you don’t remember your current password, try a password reset instead. Using the web app, press hotkey comma , or access your settings and select Preferences. In the panel that appears, under Calendar Week, choose Sunday or Monday. Using the mobile app, access your settings and, under Preferences, tap Start week on, and choose Sunday or Monday. The time zone determines when date-related processes (such as the spawning of recurring tasks, the movement of scheduled tasks and due tasks to your Focus list, and the sending of focus list emails) take place. You will see this information in the Profile section of your dashboard as a plus or minus value offset to UTC: Universal Time, Coordinated. Log into the web app, mobile app, or your account dashboard to automatically update the time zone based on your device’s settings. Discover Pro features and learn about payment and billing.